The structure of CHASM is well suited to allow scenario testing to explore parameterisation changes on the factor of safety. The software has been used in this mode to develop a design manual for tropical slopes based upon pre-defined slope geometries, hydrological and geotechnical parameter sets for two specific recurrence interval ‘design’ rainfalls. Developing charts can be a very effective way to explore generalities of apparent process controls on slope stability in a pre-site investigation context. Additionally, design charts require only relatively casual inspection to reveal the significant process controls on stability and are readily understood by those having even very limited engineering experience. Anderson, M.G., Kemp, M.J. and Lloyd, D.M. 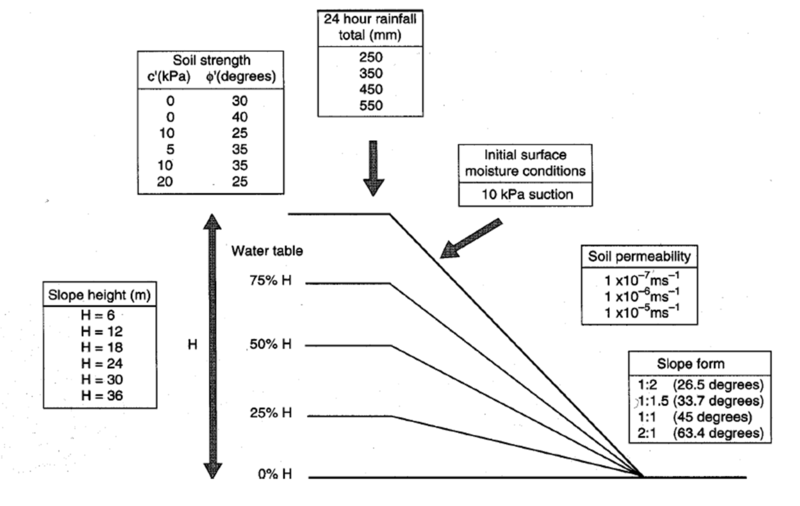 (1997) Hydrological Design Manual for Slope Stability in the Tropics. Transport Research Laboratory. Overseas Road Note 14, 58pp. Anderson, M.G. and Lloyd, D.M. 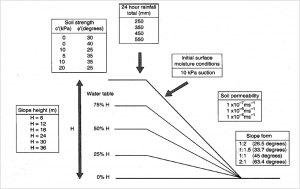 (1991) Using a combined slope hydrology-stability model to develop cut slope design charts. Proc. Inst. Civ. Engineers 91, 705-718.